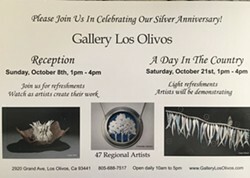 Exhibits include work by gallery artists in all mediums. Special artist receptions on Oct. 8 and Oct. 21 from 1 to 4pm. Enjoy light refreshments and local wines.